* Nora Baskin is our guest poster today. 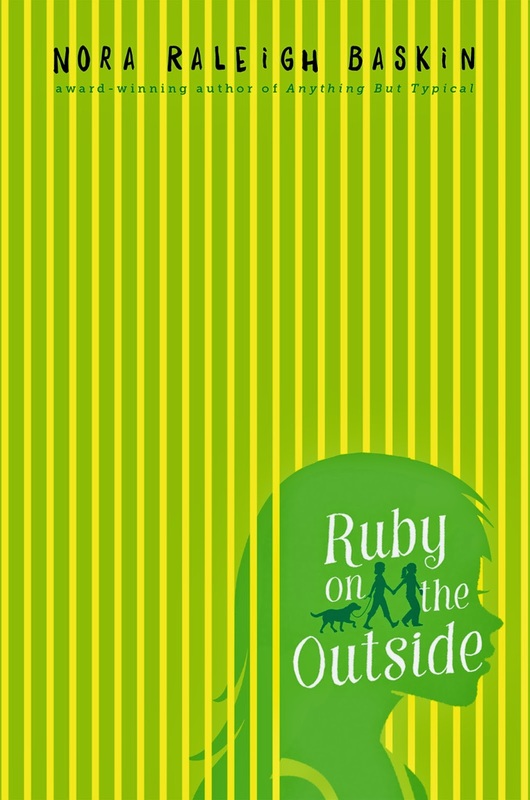 She's the author of Ruby On The Outside, which publishes this month with Simon & Schuster. As often happens in life, the things that make you the most anxious are rarely the things you needed to be concerned about. It usually turns out to be something else entirely. When I was invited to participate in Authors In April, I worried endlessly that I wouldn’t have the stamina to survive five consecutive days of school visits; each day consisting of three presentations, one workshop, and lunch with students, as well as an evening banquet, a library signing party, and the continuous interaction with others- the proverbial “being on” for six full days. As a writer, I am alone most of the time and I can go all day without speaking to anyone but Eli (my dog) and Kitty (my cat.) I worried that my voice would give out. That my throat would sting. That my brain would hurt. I feared that my ability to cope with crowds of people (which is fairly limited to begin with) would fail me. None of that happened. What took me completely by surprise was something else entirely. It was the connection. I probably need to explain. First of all, there is no other event I’ve ever attended where the students, teachers, administrators, volunteers, parents, drivers, organizers, the other three authors, and even the inn keepers were so deeply, authentically involved, and enthusiastic. The organizers had a full year to learn who I was (reading all my books, not only the ones chosen by the school for study.) I had only a few days to return the favor. It was like a first date that goes really, really well. For example, when I was asked what beverage I might like when signing books - and I casually emailed back my answer -I never imagined that the parent volunteers would provide “seltzer and cranberry juice” (as well as a table set up with fruit and healthy snacks, and the exact type of signing pen I had indicated was my preference) at every school I visited. Nor did I anticipate the intense and intimate conversations, and the occasional fits of hysterical laughter that would come from hours of sitting together (each of us had over three thousand books to sign,) eating at the same table, and driving in the same car to the various schools and events, but that’s exactly what happened. I fell in love. Maybe it was because we all came together out of our adoration for words and literature, for children and for reading. Maybe it was the extraordinary amount of time spent in each others’ company; the way you really get to know someone when you share a “fox-hole.” Certainly, it had something to do with how I came to rely on relative strangers for my every need, from the moment I stepped off the plane until I got back on again six days later. But the truth is I never did lose my voice (though it didn’t hurt to drink lots of water and load up on lozengers.) I was never too exhausted. I never even got sick of hearing myself talk, because every presentation was different, unique, and special. All the students were incredibly prepared, enormously excited. I saw posters, heard speeches, watched videos and better-than-professional book trailers. There were banners lining the streets, homemade dinners, and desserts in symbolic representations of our books. I do not consider myself a “superstar,” nor did I particularly see the value of my autograph, but suddenly I was part of something larger, a thirty-year history for this town and these students, most of whom will have a library full of personalized books by the time they get to high school, as do their parents, as will their children. So the only thing that can really explain all this fervor for children’s literature, are these amazing people; Jenny, Terry, Angie, Dee, Lisa, Lisa, Lisa,Claire, Amy, Kata, Daniel, Lynn, Chris, Jennifer, Sharla, Dale, PJ, Jenny, Sami, Marion, Michelle, Kristi, Audrey, Renee, Missy, Kim,Virginia, Jodi, Rachel, Tracy, Andrea, all the students, all the teachers and librarians, and a very special kind of magic that is created in Rochester, Michigan during a remarkable event called Authors in April. For all my worrying, what I never expected, was how close I got to everyone and how I miss them all, so very, very much. Ruby’s mom is in prison, and to tell anyone the truth is to risk true friendship in this novel from the author of The Summer Before Boys that accurately and sensitively addresses a subject too often overlooked. 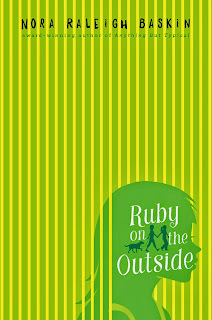 Eleven-year-old Ruby Danes is about to start middle school, and only her aunt knows her deepest, darkest, most secret secret: her mother is in prison. Then Margalit Tipps moves into Ruby’s condo complex, and the two immediately hit it off. Ruby thinks she’s found her first true-blue friend—but can she tell Margalit the truth about her mom? Maybe not. Because it turns out that Margalit’s family history seems closely connected to the very event that put her mother in prison, and if Ruby comes clean, she could lose everything she cares about most.